Handsomely packaged in your chosen Chocolate Art Box. Choose one of the many beautiful prints by artist Rick J. Delanty of San Clemente you would like featured on your chocolate gift box. 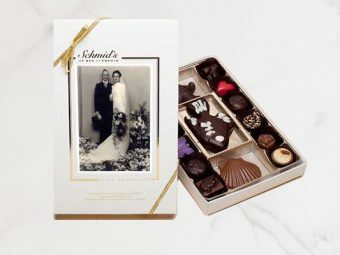 Each of the delectable chocolates in this collection has been hand-selected for their contrasting ingredients and wonderful flavor. Molded solid milk and dark seashells and fish complete this deluxe assortment.